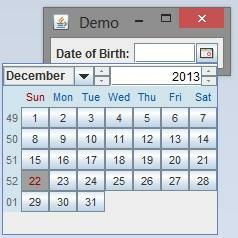 Using jCalendar is simple, it is a Java Date chooser bean that help a user choose dates more easily. it comes with an easy to use GUI that can generate dates at a click of a button, aiding coding on the part of the developer. The jCalendar comes bundled with jDayChooser, jMonthChooser, jYearChooser.